Nizhalgal Ravi was born on 16th April 1953 in Chennai, Tamil Nadu State. His birth name is Ravichandran. He attended P.S.G. Arts College, Coimbatore. He holds Bachelor’s degree in economics. He started his acting career with Nizhalgal directed by P. Bharathiraja co-starring Chandrasekhar and Rohini in 1980. He also worked in several TV series like Jannal, Appavukkaaga, Emergency Action, Thendral etc. 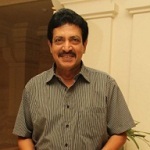 During his decades long career Nizhalgal Ravi worked in numerous commercial successful films like Vanakkam Chennai co-starring Shiva, Priya Anand and Santhanam, Kaavalan co-starring Vijay, Asin, Rajkiran and Vadivelu, Singam co-starring Suriya, Anushka Shetty, Prakash Raj and Adithya Menon, Maanja Velu co-starring Arun Vijay, Prabhu Ganesan and Santhanam, Thaamirabharani co-starring Vishal, Muktha , Nadhiya and Nassar, Citizen co-starring Ajith Kumar, Meena, Nagma and Vasundhara Das, among other films. He was born to Shyamanna and D. Rajammal. Nizhalgal Ravi is married to Vishnupriya and the couple gave birth to a son named Rahul.